The minus sign to delete the profile is disabled. Typically when you’re trying to change any network configurations on your Mac you’d go to the Network section of the System Preferences app. From this screen you can add, edit, or delete any network profile except for VPN profiles. To delete a VPN profile, you have to go to the command line. networksetup -removenetworkservice My Awesome VPN! Depending on your security settings, the computer will probably prompt you for your administrator password at this point. 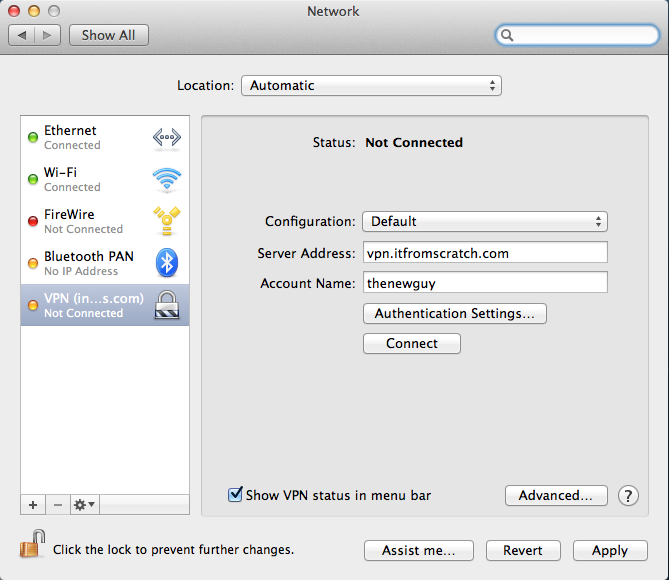 And there you have it: a Mac free of superfluous VPN profiles. For more useful articles click here to follow IT From Scratch on Twitter.